Written by LindseyReilly. May 24, 2014. 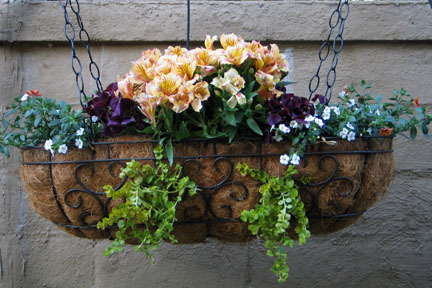 There is no such thing as a modest hanging basket. While you might opt for a subtle combination of flower and foliage colours, they will still work best packed to the brim to make a big, bold display. The fact that baskets are temporary allows you to experiment with different colour schemes and themes from season to season. And being movable feasts you can also grow plants just where you want them. If your growing area is limited – perhaps just a balcony, small courtyard or patio area – think vertical and make the most of any under-exploited space. On a larger scale, treat hanging baskets as living ornaments, using them to add focal points in the garden, to decorate outdoor living areas, and to add a personal touch at the entrance to your home. Never use a basket less than 35 cm (14in) diameter – anything smaller simply dries out too quickly – and snap up any you find with flat bottoms as they sit on any surface and make planting very simple. Most hanging baskets fall into 2 types – the traditional wire or plastic type and what are better described as hanging planters. True hanging baskets need a liner to hold the compost and are planted round the sides, base and top for an all-round massed effect. Read more at My Hanging Baskets. This post was originally written by Brook Reilly. Tags: flower baskets, flowers outside windows, gardening Cleveland Heights, Gardening Tips, hanging flower baskets, Home Contractors Cleveland, window flowers.